An astronomer claimed to have found an exoplanet... 160 years ago. Are the wiggles in the orbit of 70 Oph B due to a planet orbtiing it? In 1855, an astronomer sure thought so. The first planet ever to be discovered was found in 1781. It was an accident of sorts; William Herschel wasn’t looking for a planet specifically. He was instead scanning the sky for double stars, cataloging them as he found them. But a star he saw one night didn’t stay still. Over the course of a few nights Herschel saw it move, and realized he had done something no human had ever done before: He had discovered a new planet in the solar system. Less than a century later another planet was found. Unlike Herchel’s accidental discovery of Uranus, this one was found by applying math to the orbits of the known planets, looking for an unseen gravitational influence on their orbital motion. In a triumph of science, Neptune was seen just days after the calculations were done, quite close to the position predicted. Not much later, just a decade or so, a lone astronomer made a startling announcement: He had evidence, he claimed, of yet another planet. This one, however, wasn’t orbiting our Sun at all! It was instead bound to another star, the smaller of two stars which in turn orbited each other in a binary system. The binary is called 70 Ophichi (or 70 Oph for short), and the twist to this story is that although the evidence at first looked good, the planet itself didn’t exist. It was a phantom, a ghost manifested by small but persistent errors in the measurements of the stars’ positions. How delightful! I also read the original paper in the Monthly Notices Kipping mentioned, and it’s fascinating. I was especially glad Kipping plotted the data, creating the illustration at the top of this article. In it, the more massive of the two stars (called the primary, and designated 70 Oph A) is placed at the graph origin, and the measured positions of the secondary star are plotted. You can see the overall elliptical shape of the orbit, but also the small offsets in the secondary star’s position. I will admit, as the astronomer Captain W. S. Jacob claims in the paper, it does look like a periodic swing to the offsets, as if some invisible object is tugging 70 Oph B first one way than another. We now know, with further, more accurate observations, that no such planet exists there, and the offsets are the product of uncertainty in the telescopic observations that were, to be fair, done by eye. But still, despite that, I must tip my hat to Jacob. He did his homework, made the best observations and calculations he could, expressed skepticism in his writing, and came up with what he thought was the best explanation. Mind you, again to be fair, this took a great deal of cleverness to dream up. Perhaps he had been influenced by the recent discovery of Neptune. If anything, he was guilty of overconfidence in his own measurements. Still, technology eventually caught up with his imagination and we did start to find alien worlds. The field of exoplanet research is now a thriving one, which has moved beyond the simple discovery stage to one where we are beginning to physically categorize and model them. Not so incidentally, we have since found planets orbiting other stars using the method Jacob pioneered in 1855. He may have been the first person ever to publish this idea, and for that he deserves acknowledgment. 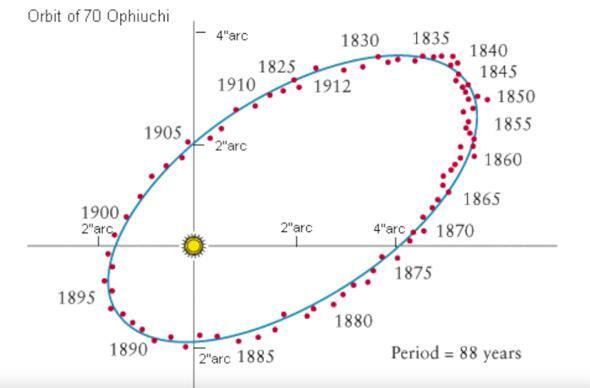 And in another twist, I can’t help but smile to think that 70 Oph was first cataloged and proven to be a binary star by none other than William Herschel himself. So I’m glad I watched Kipping’s video, and learned about Jacob. While his work may now be a footnote in astronomical history, I still find it a wonderful story, full of scientific morality lessons. Express skepticism, don’t trust your data overly much, be keenly aware of any uncertainties, and try to get independent confirmation before making grandiose claims. But also don’t let those boundaries constrict your imagination! Certainly known science must guide and shape it, and reality is the ultimate arbiter. But if we don’t sometimes stick our noses outside what we know, how will we ever push back those boundaries, expand our experience, and bring the unknown into the realm of the known.